College is a great time to buy a new bible. But, what should you look for? There are way too many choices. There are hundreds of translations in English and even more styles of bibles to pick from. Where do we even begin? First, let’s explore the various translations. The historic King James Version, published in 1611, is a familiar choice even today. If we are observant, we may notice “King James” churches, meaning this is the only Bible they would deem authoritative. King James English is old English and thus very hard to read. I am convinced that some churches use this text, not because of its poetic voice, but to limit their congregations from understanding the bible itself. The Latin Vulgate, a fourth-century bible, served this purpose until the establishment of the printing press in the 1400s. Until then, only the priest and scholars who could read Latin understood the Bible. Knowledge is power, and the thesis of one of Alister’s McGrath’s books is that Christianity’s most dangerous move was putting the accessible and legible bible into the hands of lay people (1). Seems to me that keeping the King James serves a similar purpose. Even so, according to the late biblical scholar and longtime professor at Princeton Theological Seminary, Bruce Metzger, the King James version “has serious defects” (2) and was revised by the Church of England in 1870. Why would we even use a translation that has been revised. Wouldn’t it make more sense to at least use its revision? However, the NKJV (New King James) is equally flawed. Amusingly, those who show its defects the most are proponents of the originally flawed KJV. The New International Version is the most widely distributed bible. The NIV is published by Biblica, aka the International Bible Society, a mass distributors of bibles and licensed to Zondervan. Another favorite Bible these days is the English Standard Version. The ESV is published by Crossway, a ministry of Good News Publishers. Both Zondervan (NIV) and Crossway (ESV) are incredibly evangelical firms that print books and bible translations that “distort the text to a discreditable degree,” and what renown Biblical scholar David Bentley Hart at Notre Dame calls “pious fraudulence” (3). In 2006 Zondervan published the TNIV, an updated version of the NIV. The revision had various linguistic updates, but also included theological alterations, such as in Matthew 1:18 and utilized gender-neutral language where appropriate, like in Hebrews 12:7. The TNIV created a firestorm and forced Zondervan to halt its production and release a revision of the NIV in 2011 that haphazardly corrected some of the flaws of the NIV and most of the divisions created by the TNIV. Of note the CEV (Contemporary English Version) was produced mainly to reduce anti-semitism in the New Testament. Often “Jews” is replaced with “Jewish leaders” to indicate that not all Jews were opposed to Jesus. As admirable as this is, the CEV has major flaws in other areas. The NASB is more accurate than ESV, CEV, and NIV, but there are even better options. Errors in translation are inevitable. After all the bible is a collection of books written in Hebrew, Aramaic, and Greek. Because of this, we will continue to see more attempts at Bible translations. However, two translations have widespread scholastic support, and serve as the standard for biblical studies across the English speaking world. The New Revised Standard Version (NRSV) copyrighted in 1989 by the National Council of Churches and the Common English Bible (CEB) copyrighted in 2013 by a collection of five denominations. No translation deserves absolute loyalty. I use many. Sometimes I even go back to the original languages to the extent that I can. However, I strongly recommend that your primary bible source be either the NRSV or the CEB, hands down, no questions. And those days when you find yourself in a bind, compare the version you choose with the multitude of versions available online for free. The complicating factor is that the scholarly choices (NRSV or CEB) don’t have the big publishing companies printing exceptional styles of bibles to choose from. The best translations have limitations in the stylistic department. With this in mind, lets walk through a few bibles that can possibly meet your needs. Study bibles are formed for reference and tend to be pretty large editions, however if you are serious about having just one bible, or one main bible, then a study bible is the best option. Here biblical experts provide various notes to help you understand this ancient text as best as possible without having to search online or elsewhere for answers. 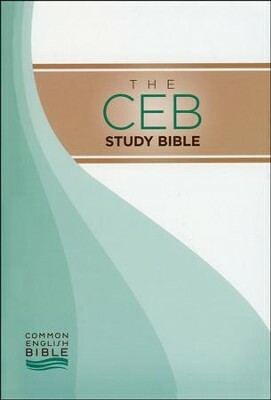 Rank: #1: The CEB Study Bible. The CEB Study Bible has stellar scholarship. Moreover, the print and design are by far superior to any of the study bibles mentioned below. An incredibly helpful addition is the marginal cross-references, that simply don’t appear in the volumes below. This tool alone allows readers to gain a more productive and fuller understanding of the biblical narrative. I just wish the CEB Study Bible were available on Kindle, and in a version that matches the printed version. Rank #2: The New Interpreters Study Bible. This is my favorite NRSV study bible. It has all of the qualities of both the Harper Collins and New Oxford study bibles,, mentioned below, but the typeset and design is just better and more accessible. Even the notes seem to produce more helpful information. Rank #3 (tie): Harper Collins & New Oxford. The leading choices among scholars are the Harper Collins Study Bible (NRSV) and the New Oxford Annotated Bible (NRSV). Both of these are excellently produced and available on Kindle as well, except the New Oxford Kindle version looks exactly like the printed version (a plus for me). Both of these study bibles have stellar editorial boards from top research universities. Both have an array of essays, book introductions, study notes, and great indexes. However, the Harper Collins Study Bible has headers throughout, like in Matthew 5 “Concerning Retaliation,” and “Love for Enemies,” whereas the New Oxford does not divide the text in any way other than the actual chapter number and verse splits. They are tied because Harper Collins has the better print version (with the headers), but the New Oxford has the better Kindle version (looking more like an exact pdf version of the print). 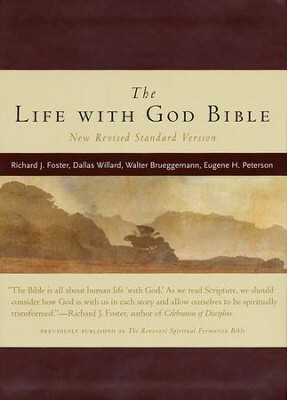 Rank #4: The Life with God Bible. This is my most used NRSV study bible. The focus in this study published by Renovare, an excellent spiritual resource, is not so much academic, but more a of spiritual formation guide. It is very readable, has good notes, a helpful index, and best of all comes in a compact version. I do rank this #1 for compact study bibles, and its because of its compact size that this is my most used bible. Rank #5: The CEB & NRSV Wesley Study Bible. This Methodist study bible isn’t a bad alternative. It comes in both CEB and NRSV and is much more manageable than the more cumbersome and more significant study bibles already mentioned. Because it is available in both the CEB and NRSV and because of it much lighter, it ranks just above the Lutheran version. Rank #6: The Lutheran Study Bible. If you are a denominational loyalist, the Lutheran Study Bible (NRSV) is well designed. It has a great index and wide margins for notes. However, that extra whitespace for your notes means less scholastic notes are available. Honestly I think the notes in the Lutheran Study Bible are appropriate for anyone of any denomination. Rank #7: The Harper Study Bible. Don’t confuse this Zondervan published NRSV study with Harper Collins. There are better options available. Rank #8 (tie): ESV & NIV Study Bibles. Both of these are similar in size to the Harper Collins and New Oxford, but remember both the ESV and NIV are poor bible translations. Whereas scholars write the study notes in both the Harper Collins and New Oxford editions at places like Yale, Harvard, Duke, Princeton, and Emory, the study notes for both the NIV and ESV study bibles are written by professors at places like Southeastern Baptist Seminary, Regent College, and Dallas Theological Seminary. There seems to even be an inferior complex among these scholars because they do mention where many received their doctorates (Cambridge, Fuller, Chicago, and other top schools), but for some reason, they aren’t representing the faculty of any of those universities. Also, don’t let the Amazon reviews fool you. Remember the NIV and ESV are the most widely distributed bibles in the world, pushed by aggressive publishing houses. They simply have many more readers. But more isn’t necessarily better. More people go to first grade than graduate school. Don’t be fooled by more reviews, even more good reviews. 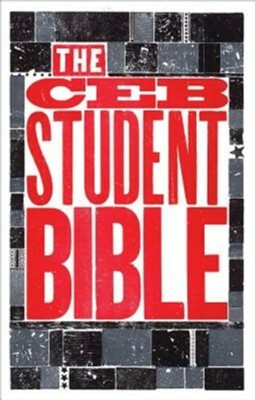 Rank #1: The CEB Student Bible. The notes are excellent, even written by some of my friends. Rank #2: NIV, NRSV Student Bible. Editors Phillip Yancey and Tim Stafford have both an NIV and an NRSV student bible available. The 1986 NIV edition was my first bible.The notes aren’t bad. I would recommend the NRSV over the NIV. Rank #3: Colaborate Lutheran & Colaborate Methodist. Both of these Lutheran published student bibles play on the word collaborate and emphasize the interactive or “lab” nature of their design. A few introductory pages, in the beginning, distinguish the editions. The Lutheran has a hard to read orange subtext, whereas the Methodist version has a more clear red subtext. Both are a bit heavy and bulky for student bibles.